Corneal blindness is the second most common cause of blindness worldwide. The main treatment option against corneal blindness is corneal transplantation, the oldest and most commonly performed form of organ/tissue transplantation (1). Main unsolved problems in corneal transplantation include donor tissue shortage, immune reactions in the high-risk setting and surgical complications (2). 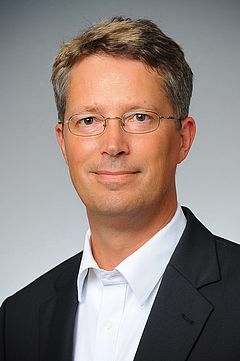 Professor Cursiefen and his team in recent years have developed numerous strategies to improve corneal graft survival and success, both in the low-risk and in the high-risk corneal transplant setting (2). That refers to immunomodulatory and anti(lymph)angiogenic strategies to reduce the risk of immune reactions as well as surgical and pharmacologic improvements to avoid complications and improve outcome and quality of life for patients. Several of these novel concepts have been tested in phase I/II or III clinical trials, have been patented, or are already in clinical use nowadays. A great help for making corneal transplantation more successful was the establishment of Research Unit 2240 of the German Research Foundation (DFG) at the Dept. of Ophthalmology at University in Cologne in 2015 (“Lymphangiogenesis and Cellular Immunity in Inflammatory Diseases of the Eye”; www.for2240.de; 3) with Prof. Cursiefen as Speaker, still the only DFG funded Research Unit at a German University Eye Department. Furthermore the EU COST Action BIOCORNEA (www.biocornea.eu; for video see: https://www.youtube.com/watch?v=9r51flS6QHM) and the Horizon 2020 project ARREST BLINDNESS (www.arrestblindness.eu) have been instrumental in achieving joint research activities with industry and other European Academic partners. In the low-risk corneal transplantation setting, that is, corneal transplantation performed in preoperatively avascular eyes, such as in patients with keratoconus and Fuchs’ corneal endothelial dystrophy, several approaches have been developed to make surgery more safe and outcomes better. The isolated transplantation of Descemet’s membrane in corneal endothelial diseases using DMEK (www.dmek.de) and the isolated transplantation of stroma for anterior dystrophies such as keratoconus in DALK was pioneered at the Dept. of Ophthalmology at University of Cologne (4, 5). The University of Cologne is a European Center of Excellence for lamellar and penetrating corneal transplantation, with more than 800 transplants performed per year (that is around 10% of all corneal transplantations done in Germany). These advances, for example, include the development of a high-dose postoperative anti-inflammatory therapy with topical steroids to avoid the development of cystoid macula edema after corneal transplantation (6), the observation that hydrophilic acrylate lenses should be avoided in DMEK surgery because of their tendency to develop calcification (7) and the finding that there is a year-long learning curve after DMEK (8). Finally, intracameral SF6 gas tamponade was shown to significantly reduce the rate of donor tissue detachment postoperatively (9). Figure 1: Principle of split cornea transplantation to reduce corneal donor tissue shortage. One donor cornea is used for two recipients by combining deep anterior lamellar keratoplasty (DALK) e.g. for a keratoconus patient and Descemet's membrane endothelial keratoplasty (DMEK) e.g. for a Fuchs' endothelial dystrophy patient. From ref. 11. 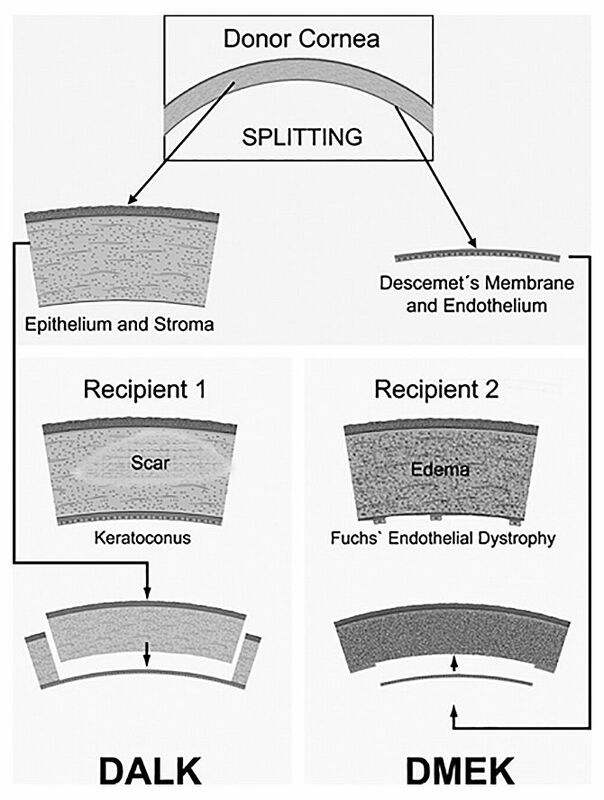 Another important step against donor tissue shortage was the development of the split cornea transplant concept (Figure 1). That means the dual use of a single donor tissue for at least two recipients (10, 11). This became possible by combining the use of an anterior corneal lamella for use in DALK surgery for patients with, for example, keratoconus and by using the posterior lamellar in DMEK for patients with, for example, Fuchs’ dystrophy. The team could show that this approach was both safe and also clinically applicable and yielded similar clinical success as the single use of a donor tissue (10, 11). This approach can significantly alleviate corneal transplant tissue shortage both in Europe as well as worldwide (10, 11). A major focus of our work was the implementation of novel imaging tools during surgery (intraoperative OCT) to make DMEK and DALK surgery more safe. iOCT allows not only for the imaging of the DMEK lamella rolling behavior in the eyes with very opaque corneas (12), but also makes DALK surgery more safe and successful by allowing the surgeon to estimate the depth of the needle position (13). Intraoperative OCT has been established as a novel, innovative tool to make modern lamellar corneal transplant surgery more successful and safe (14). Figure 2: Corneal lymphangiogenesis. Evidence for combined outgrowth of clinically visible blood vessels (stained in green) and clinically invisible lymphatic vessels (stained in red) into the normally avascular cornea under inflammatory conditions (from ref. 20). In the context of vascularized, so-called high-risk cornea transplant patients, so far the problem of corneal graft rejection was a major issue. In contrast, in modern lamellar posterior keratoplastic surgery, graft rejection rates now only reached two percent (15). In contrast, there is still a high unmet need to improve graft survival in vascularized, high-risk eyes (16). 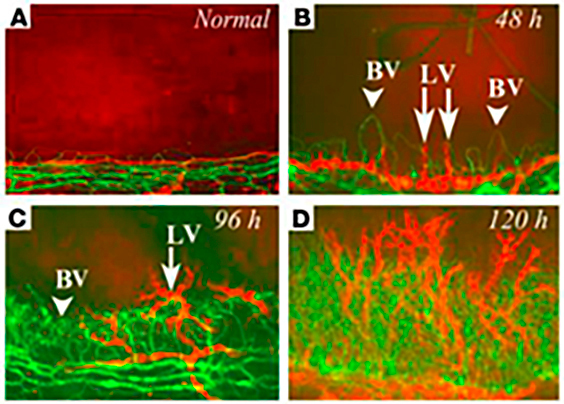 Here Prof. Cursiefen and his team made the seminal observation that vascularized human corneas, besides clinically visible blood vessels, also contain clinically invisible lymphatic vessels (17; Figure 2). These lymphatic vessels could be shown to be driven by macrophages and VEGF A (20) and to be key players mediating graft rejections after corneal transplantation (18-21; Figure 3).Finally, in several preclinical studies, it could be shown that targeting lymphatic vessels prior to as well as after corneal transplantation can promote graft survival (Figure 4). This novel therapeutic concept of “Temporary selective preoperative lymphangioregression to promote graft survival after subsequent transplantation” is on its way into clinical translation (18-21). In phase II and III clinical trials, novel antilymphangiogenic agents have been shown to be able to inhibit and even regress postsurgical corneal neovascularization (22,23). First pilot studies show that preoperative regression of lymphatic vessels promotes graft survival also in the human setting. 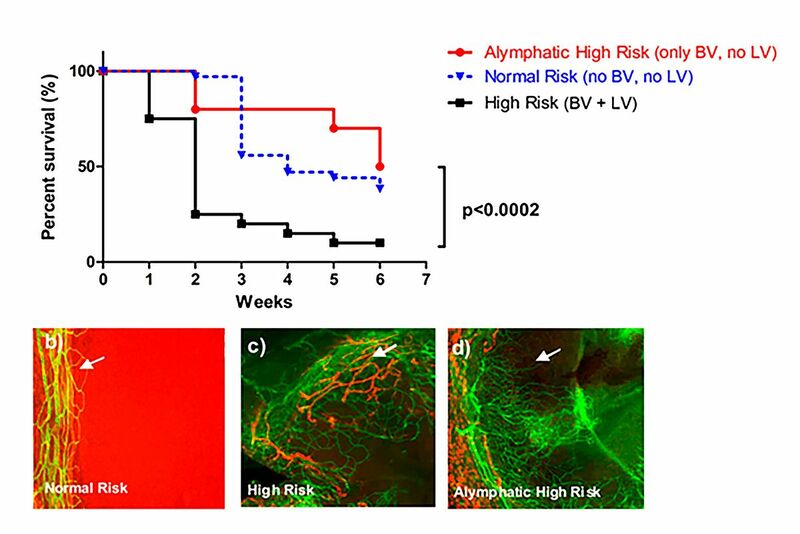 Figure 4: Pretransplant regression of lymphatic vessels in the high-risk recipient cornea sig-nificantly improves graft survival. a) Kaplan-Mayer survival curves in differentially vascular-ized recipient beds (BV: blood vessels; LV: lymphatic vessels); b-d) corneal whole mounts stained with CD31 (blood vessels; green) and LYVE-1 (lymphatic vessels, red) in different recipi-ent beds. This study shows LV to be the prime mediator of immune responses after corneal transplantation. Modified from ref. 21. 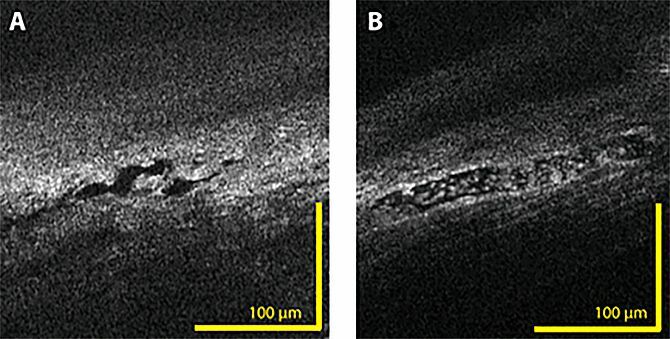 Since so far there was no reliable technique to regress clinically invisible corneal lymphatics, many recent studies from the group showed novel tools for regressing clinically invisible lymphatic vessels, for example, using photodynamic therapy, fine-needle diathermy, or corneal crosslinking (24,25,26). Preoperative lymphangioregression using these techniques was shown to promote subsequent graft survival in murine transplantation models. A major focus here again was on imaging to visualize clinically invisible corneal lymphatic vessels. An industry collaboration within ARREST BLINDNESS enabled to develop a microscopic OCT technology (cooperation Opmedt GmbH, Laserzentrum Lübeck), also adapted to the slit lamp, which allows a resolution of below 1 micrometer. For the first time, it was possible to image corneal lymphatic vessels non-invasively using OCT technology (27; Figure 5). Figure 5. Label free imaging of clinically invisible lymphatics in the cornea using microscopic OCT with a lateral resolution of 1 µm (ref. 27). Overall, this novel concept of temporary pre-operative regression of lymphatic vessels in vascularized high-risk eyes to promote subsequent corneal graft survival is not only applicable to corneal transplants, but also in other fields of transplantation outside of the eye. Significant progress also has been made in the area of artificial corneas in severely damaged eyes. For example, iOCT was shown to more reliably allow for Kpro assembly (28-30). In another pivotal study intraoperative pressure sensors for telemetric IOP evaluation were shown to be able to solve the issue of non-measurability of IOP in eyes with keratoprostheses (29,30). Finally the fish-scale based BIOCORNEA is in clinical testing for alleviating donor tissue shortage in the future as part of ARREST BLINDNESS (www.biocornea.eu). In summary, key progress has been made in improving graft survival and graft outcome in both lamellar as well as in penetrating, high-risk corneal transplantation. Future endeavors are the personalization of these approaches in different forms of vascularized high-risk eyes and the further translation into everyday clinical routine. Another important work aspect is the translation of these concepts into other fields of tissue or solid organ transplantation outside of the eye. Steven P, Le Blanc C, Lankenau E, Krug M, Oelckers S, Heindl LM, Gehlsen U, Huettmann G, Cursiefen C. Optimising deep anterior lamellar keratoplasty (DALK) using intraoperative online optical coherence tomography (iOCT). Br J Ophthalmol. 2014;98(7):900-4. Cursiefen C, Cao J, Chen L, Liu Y, Maruyama K, Jackson D, Kruse FE, Wiegand SJ, Dana MR, Streilein JW. 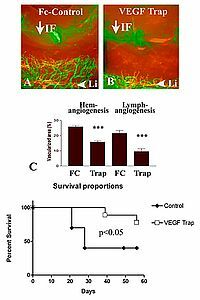 Inhibition of hemangiogenesis and lymphangiogenesis after normal-risk corneal transplantation by neutralizing VEGF promotes graft survival. Invest Ophthalmol Vis Sci. 2004 Aug;45(8):2666-73. Cursiefen C, Chen L, Borges LP, Jackson D, Cao J, Radziejewski C, D'Amore PA, Dana MR, Wiegand SJ, Streilein JW. 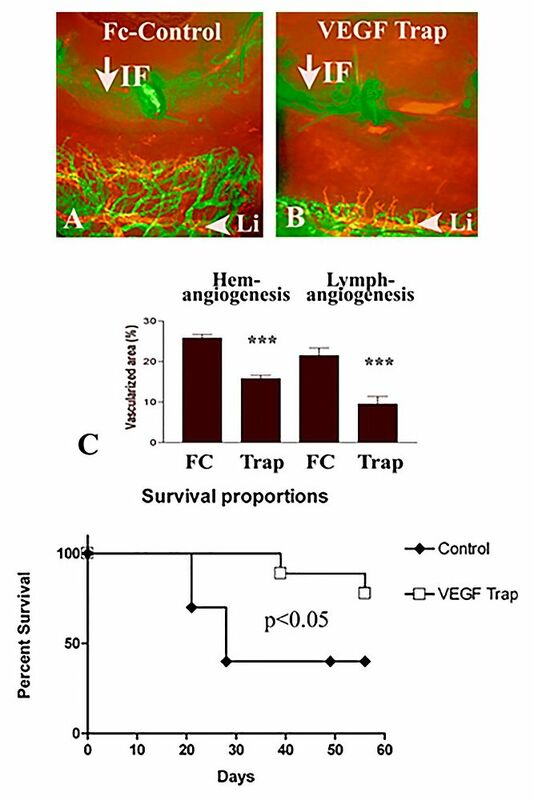 VEGF-A stimulates lymph-s and hemangiogenesis in inflammatory neovascularization via macrophage recruitment. J Clin Invest. 2004;113:1040-50. Dietrich T, Bock F, Yuen D, Hos D, Bachmann BO, Zahn G, Wiegand S, Chen L, Cursiefen C. Cutting edge: lymphatic vessels, not blood vessels, primarily mediate immune rejections after transplantation. J Immunol. 2010 Jan 15;184(2):535-9. Cursiefen C, Bock F, Horn FK, Kruse FE, Seitz B, Borderie V, Früh B, Thiel MA, Wilhelm F, Geudelin B, Descohand I, Steuhl KP, Hahn A, Meller D. GS-101 antisense oligonucleotide eye drops inhibit corneal neovascularization: interim results of a randomized phase II trial. Ophthalmology. 2009 Sep;116(9):1630-7. Schaub F, Neuhann I, Enders P, Bachmann BO, Koller B, Neuhann T, Cursiefen C. [Boston keratoprosthesis: 73 eyes from Germany : An overview of experiences from two centers]. Ophthalmologe. 2018;115:744-753.